For a few days I tentatively perched on second place in Gregg’s March Madness bracket, so of course I had to share that remarkable feat with you. It was short lived, as I slipped down several places soon after. On Monday, the day of the final game, I Google-mapped Villanova, figuring if I planned to cheer on my chosen winner, I should at least know where the school is. I felt a bit sheepish because their opponent was Michigan! Well, Villanova won — and I won! 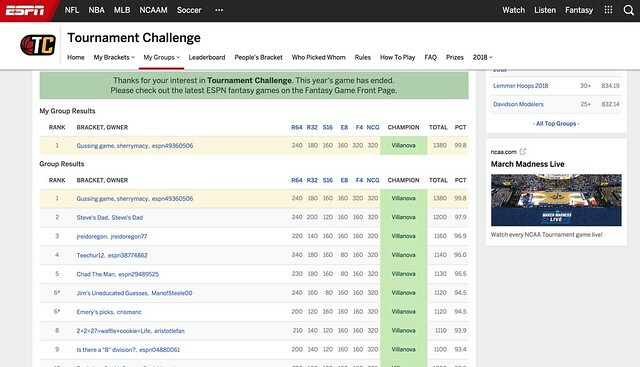 You can see that others in the 110-member bracket chose Villanova as well, but I took the first prize because of my picks leading up to the final game. 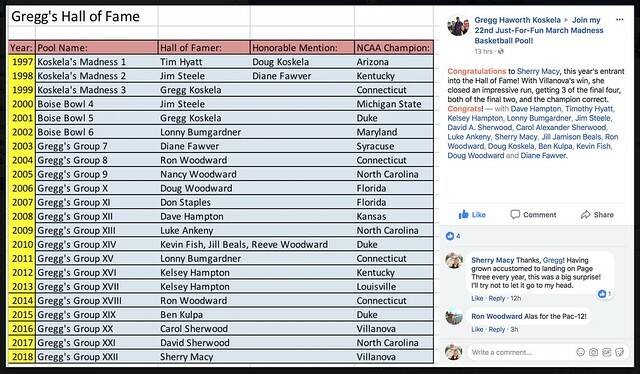 “First prize” means taking my place of honor in Gregg’s Hall of Fame! But let’s put this all in perspective: I ranked 41,403rd in the overall ESPN March Madness Men’s Tournament Challenge. No big deal.